A whole lot of work has been done, focusing on beatmap conversion, compatibility, performance and bug fixes. A lot more maps should now play correctly and performance should be 2-10x higher than what it was. Also, basic skin support is in! Until now, we were relying on a global replay frame across all rulesets, to allow for importing replays from existing .osr files. While this had its place, we definitely want a more generic replay frame structure going forward. This change separated out the legacy frames from a newer frame format which can be designated by the ruleset itself. You can now see outlines surrounding the selected objects. Another step forward for the editor! We heard your feedback and have reduced the parallax effect on gameplay screens. This should mean you can still enjoy distraction-free gameplay without completely disabling parallax. After getting a lot of framework in place, we can finally import skins! Drag-and-drop an .osk into the window and you should now see your skin under the new dropdown. Note that this is not the final method of selecting skins. For now only a few skinned elements are implemented as a trial of the implementation. Going forward we will gradually be adding further elements. Parsing of skin.ini is the next priority. Quite a few users were reporting full screen mode switching their display colours to 256 colour (definitely less than how many we need!). Should now be resolved. Tackling performance at the lowest level, I made some changes to the way shader properties were assigned to reduce overhead. 5-10% improvement in the best cases. There was a regression when rewind support was added causing old (already-completed) transforms to continue updating indefinitely. This saw performance degrade over the length of a beatmap. Now resolved. Buffered containers are our method of drawing to textures. We use them regularly to cache complex drawable structures and reduce overhead. Until this change, the caching was only improving performance in very minimal ways (mostly fill rate). Now, the cached state stops all child updates and expensive draw thread updates. Adding back missing profile pieces. Graph design is going to be updated to feel a bit better, consider this temporary! It was noted that finding the search option on small screens was near impossible. We’ve adding an always-visible search box to solve this one. Page content-related descriptive text is now prioritised at the start of page titles, so you can more easily find tabs. 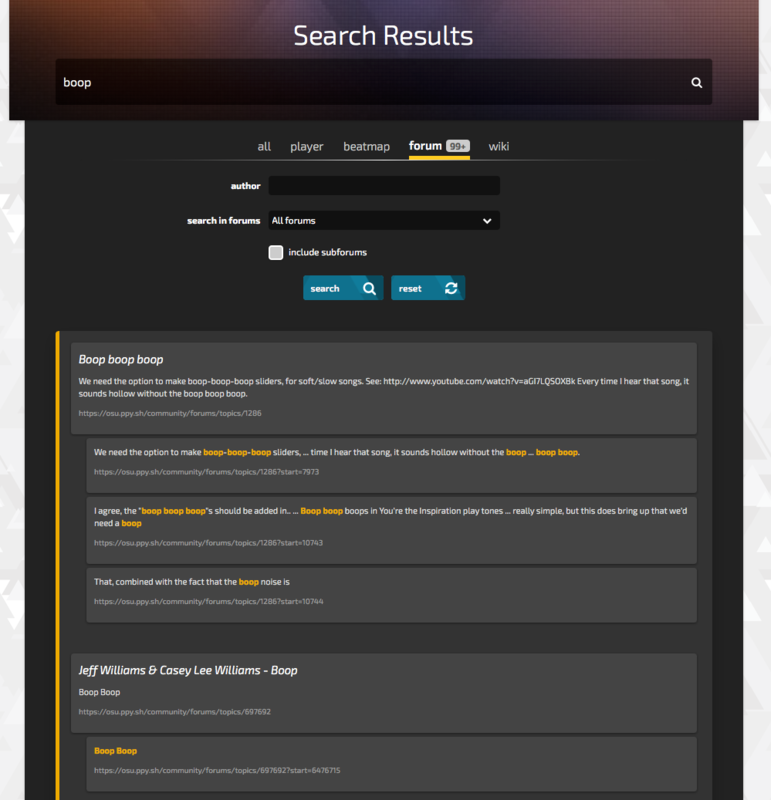 Forum search have received some upgrades. Go test it out here.